It was quite for Sunday's race but today it was creaking again while riding in CT NEMBA's Monday Ride After Work (RAW) series. I think what I am going to do is pop out the cups later this week, see if there is any cracking, and if not lube them and reset them onto the headtube. Despite the creaking noise we had a pretty good ride Monday evening with some more participants. Besides Vin, Paula showed up but bailed after riding the Big Burn and there were two teenagers Randy and Chris. We did a warm up on Rock & Roll, the boys had fun climbing up and rolling down this rock in the middle of trail. From there we hooked around to the Lower Dodgingtown Lot rode around the Big Burn including hitting what I call the Saddle Roller (in the video below). From there we rode the singletrack that connects with the trail from Little Vomit and headed into the northern section of the park. Right before the start of the big downhill trail that connects to the trail that leads to that deadend road in Newtown we took an offshoot trail that loops back on the trail we just rode. 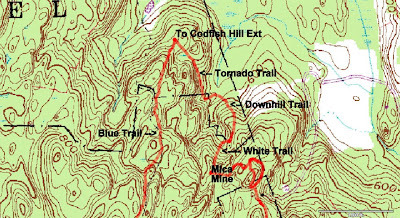 Looping around again we took the right branch of this trail and it took us to the Mica Mine. Funny, for some reason I always thought it was further to the south but then I recognized the descent that you ride if you were coming from Big Vomit. It's funny how the old miners went in two different directions but still left a section separating the two digs, so naturally someone put a trail over it. From there, we were on the blue trail once again but broke off and took the white section which is a steep downhill that crosses over a stream and then climbs up to the downhill trail from where we previously turned off for the Mica Mine, which looks daunting but is truly a no brainer, even on a singlespeed. The downhill section of the trail has a few nice hucks in it that are always fun to hit and soon enough we are back on the blue trail. 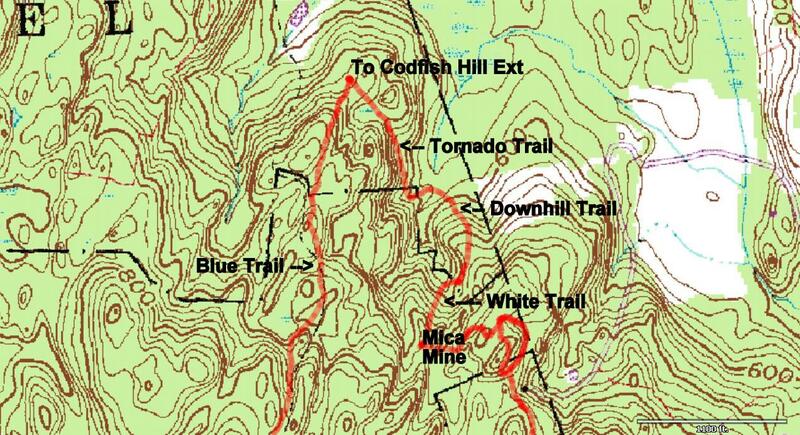 That leads you up through the Tornado Trail, that is where the Tornado touched down two years ago, knocking a tree down and blocking the trail. The smaller stuff was cleared but not the big stuff so the trail now goes around it. Then you turn back and start climbing again. If you were to go straight you would run into the dead end section of Codfish Hill.By this point it was 7:30 PM so we rode back to the parking lot, making sure to hit as much singletrack on the way back as possible.